For homes with hardwood or tile stairways, a carpet stair runner is both a beautiful and practical addition. Carpet stair runners run up the middle of the stairs, not quite edge-to-edge. So you'll still see your hard surface floor with the added advantage of some color and comfort underfoot. Stair runners are a great way to make a slippery hard surface stairway easier to manage. 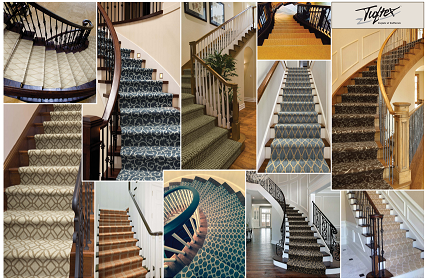 Indianapolis carpet store Kermans has a few tips to consider when choosing your carpet stair runner. Most stairways have common widths of 3 feet and on these a runner that is approx 27 inches wide will give you good coverage while still letting some of the beauty of the hard floor beneath show. If you have a wider stair case you should leave a wider gap on the sides but still provide good coverage. You'll want to have your stairway professionally measured to help determine the best width for the stair runner. Patterned carpets are very popular particularly on stair runners. However, you will want to stay away from geometric patterns that can be very distracting when bent up a staircase - particularly if your stairway is curved. Large floral or nature-inspired patterns work well on stairways. If you have a wide staircase a larger pattern might work better than a small pattern. As with any carpet selection you'll want to bring home a sample to get a feel for how it looks in your home. Simple, non-patterned carpets are also a great option depending on the floor that leads up to the stairway on each end. If you want a runner that exactly matches your carpet, you can have one cut to fit. You'll need to decide if you want a continuous stair runner or one that only covers the stair tread. A continuous runner is one long piece of carpet from top to bottom that bends to cover each stair. A stair tread runner covers only the bottom of the stair, leaving the back of the stair uncovered. There is no best choice, it is purely a preference for your home decor. If you do choose a stair tread runner, we recommend a non-patterned carpet since the carpet is visually broken up from step to step. Carpet padding is an important part of any carpet installation and makes the carpet last longer and more comfortable. For a stair runner you will want a thin but dense carpet pad. The flooring design consultants at Indianapolis carpet store Kermans can guide you in this final selection. Indianapolis carpet store Kermans can help you find the right carpet for any room or situation. Our showroom carries a wide variety of well-known brands and styles. Stop by, do some shopping and ask to speak to one of our free design consultants - they can help you find just the right stair runner for your home.